The 36th Chamber of Shaolin is widely considered one of the greatest Kung Fu films ever produced. 36th Chamber of Shaolin is a brilliant piece of filmmaking, which has survived the ravages of time and a plethora of lesser imitators. The pacing to the piece never lets up and, thought the storyline is slender; it never dulls during its near two hour length. The training scenes which take up the bulk of the screen-time are very enjoyable to watch and never feel like an extended montage; Yu-de/San Te learns from his mistakes and grows as a character. Admittedly the final showdown between San Te and Lo Lieh feels somewhat less epic than the initial set-up suggests, but it still manages to satisfy as a showcase for excellent martial arts action. Put simply, the film lives up to its hype. 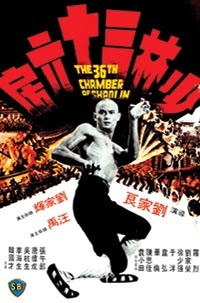 36th Chamber of Shaolin is a true classic which any self respecting genre fan should own. For everyone else it’s an eye opener which is a terrific introduction to the world of martial arts.